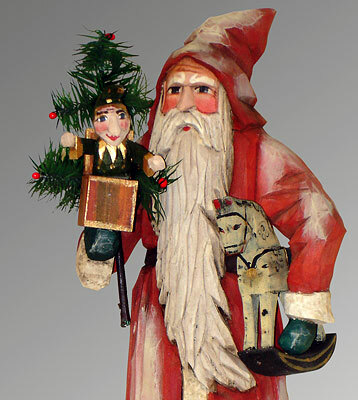 Hand carved from basswood, this Santa was inspired by antique German Christmas figures. This old man, with his long flowing beard, is carrying a dappled rocking horse and a jester in a box. A large feather tree is in the crook of his arm. His coat is painted to resemble the faded red of the antique Santas. Santa is bringing Toys for You.